Ocean's Edge is decorated and furnished in the warm spirit of the Caribbean - you'll find it comfortable and inviting. The two-level condominium, with three bedrooms, three bathrooms, and a loft with sofa sleeper, provides accommodations for eight guests. Your fully air-conditioned home away-from-home includes a full-size kitchen, well supplied with dishes and utensils, a dishwasher, microwave, toaster, and coffee maker. If you would like to enjoy a quiet evening at home, your many options include a plasma TV with HBO, Blu-ray DVD, a stereo, CD player with an iPhone and iPod dock and charger and free Wi-Fi. Apito (Ah-pee'-toe) is a casually elegant and very private home on the island of St. John in the U.S. Virgin Islands. The name is inspired by the language of the early inhabitants of the island, the peaceful Taino Indians. Roughly translated, it means "Infinity", which both describes the view and the length of time many guests may wish to stay once they've discovered this fully air conditioned, two bedroom, with pool, hideaway villa. Completed in June 2009, Apito was built and furnished with the complete comfort and relaxtion of guests in mind. Visit their website for more photos, rates, and complete info. Andante by the Sea is a 3 bedroom, 3 bath private, modern architect designed villa fronting St. John's Hart Bay. Among the many assets guests rave about are its stupendous 270 degree, sunrise to sunset views, exotic gardens, air conditioned bedrooms, each with private decks and views, fully equipped kitchen, expansive covered lower level patio with hammock and the amazing hot tub and pool cantilevered into the side of the hill for maximum views. Visit their Web site for photos and complete information. Artistic, luxury Villas created, owned and managed by famous local artist Donald Schnell allow you to stay in class and style in unique, comfortable, private Villas of all price ranges. Visit his Villa and Studio Web site for more information. Bay Rum Breeze is a new (November 2010) three bedroom, three-and-a-half bath villa in Coral Bay. Take in the magnificent views and experience the luxury of a villa that caters to your every need. Each of the three private bedrooms has a full bathroom, a private deck, and a splendid view overlooking Coral Bay and the British Virgin Islands. Swim in the pool, relax in the sun on the spacious pool deck, or dine outside under the veranda. After a day at the beach, wind down in the comfortable great room or enjoy the night sky as you soak in the hot tub or lie on the stargazing deck. Visit their website for more information and photos. Beach Nuts Vacations - Offering the largest variety of island accommodations and activities. Quaint honeymoon cottages to luxurious beach villas, sailing charters, watersports, and wedding planning. Call 1-888-722-2255 or visit their Web site for more information. Blue Tang is a new, luxurious two-bedroom, two-bath, air-conditioned villa overlooking Great Cruz Bay. It has spectacular views of St. Thomas and the BVI's. Privacy, tasteful furnishings and dramatic indoor and outdoor living spaces insure a vacation spent in Blue Tang will be romantic and memorable. Visit their Web site for photos and rates. Bongo Bongo is a brand new, two-bedroom villa in upscale Chocolate Hole North, with great South Shore views, and one of St. John's biggest pools. The villa features a chef's kitchen with Viking range, and handsome and comfy furnishings with completely private air conditioned bedroom suites with king-sized beds, garden showers and private patios. Bongo Bongo is one of the island's coolest new villas. Visit their site today for more information. Carefree Getaways office is located overlooking Cruz Bay on the sunny isle of St John. Not only are we a villa management company, but we are here to personally assist all our guests in making their vacation totally carefree! You will find our St. John villa rentals are some of the most beautiful and varied in the USVI. We will help you reserve the villa that fits all of your needs, with vacation rentals suitable for every size, budget and occasion. Please let us assist you in making this your perfect vacation filled with island hospitality! Browse our villas to find the your perfect St John Vacation Rental, or call us and we'll make recommendations to help you decide which one is best for your next memorable St. John vacation! We look forward to speaking with you! Visit carefreegetaways.com for more details. Caribe Havens has a fine selection of vacation rental homes on St. John. Caribe Havens represents privately owned villas that differ in both location and amenities. Visit their Web site for more information. Catered To Villa Rentals offers a taste of paradise to please every palate. Their spectacular private homes accommodate two to ten people, are beautifully furnished and landscaped, all with breathtaking sea views, most with pools or spas and air conditioned bedrooms. Located near Cruz Bay, the Virgin Islands National Park and the best beaches each has a fully equipped kitchen, all linens, TV, VCR, stereo, gas grill, beach chairs, beach towels and coolers. Maid service, provisioning and airport transfers are available. Catered To greets you personally at the Cruz Bay dock and are on call twenty-four hours a day to make your holiday perfect. Join them and be ... catered to! Visit cateredto.com for more details. Chateau La Tête Rouge, a French phrase meaning "The Red-Headed Castle", is aptly named for its crown of vibrant ruby-red glazed roof tiles that shimmer like jewels in the bright tropical sunlight. Located approximately ten minutes from downtown Cruz Bay, in the luxury estate community of Point Rendezvous, La Tete Rouge overlooks St. John's resplendent south shore including the gentle curves of Hart, Monte, Rendezvous and Fish Bays. Visit their Web site for photos and rates. Coconuts Located on a flat, private hilltop, Coconuts features spectacular year-round sunsets and panoramic ocean views of up to twenty islands, ranging from French Cap in the south, to Grass Cay in the north. Coconuts epitomizes Caribbean indoor-outdoor living, with four buildings centered around a solar-heated pool, interior gardens, covered walkways, spacious decks, a large spa, front and side lawns, a billiard porch with an outdoor kitchen, and a living and dining gazebo. Coconuts' sophisticated home entertainment system includes large flat screen TV's, a 103" front projection system with sub-woofer, an eclectic Blu-ray/DVD library of over 50 titles, and outdoor sound systems. With its charming traditional Caribbean architecture, spectacular sunset and ocean views, and numerous high-end amenities, Coconuts is the ideal villa for your next visit to St. John. "Bliss" is the new name given to Cruz Views #1 - an all-new penthouse townhome (following a complete down to the studs renovation) within minutes of the amazing National Park Beaches. Walkable to town but up in the hills far enough to be a peaceful retreat, Bliss is a 2BR/1BA, 2-story penthouse unit. Not only completely remodeled, Bliss also has all updated furnishings including new beds as well as all new bedding, linens, kitchen supplies, appliances, entertainment systems, and Central Air-Conditioning to keep you comfortable all year long! Visit the owner's page on VRBO for availbility and more photos and details. Gallows Point Resort is majestically nestled on a meticulously landscaped tropical peninsula, surrounded by the pristine blue waters of the enchanting Caribbean Sea. Gallows Point Resort is the ideal blend of luxurious living in perfect harmony with St. John's spectacular natural beauty. Featuring large one bedroom suites with fully equipped kitchens and beautiful views of the Caribbean. Close to Cruz Bay, yet worlds away. Visit their website for details. Great Expectations is one of St John's most popular villas. Great Expectations accommodates up to 14 people with 7 bedrooms, 2 swimming pools, 2 hot tubs, and a private basketball/tennis court! Spectacular 'double' views overlooking the Caribbean with both the sunrise and the sunset. Conveniently located in Chocolate Hole. "Best damn villa on St. John"... that's what one of their guests had to say! Check out this popular St. John villa rental. Villa DISCOUNTS available by renting directly through the owners at 1-800-553-0109. Hillcrest Guest House Vacation rental suites have Million Dollar ocean views. Three (3) minute walk to Cruz Bay & Frank Bay Beach. All suites are air conditioned, have a kitchenette, Cable TV, DVD, complimentary movies, beach equipment, food and free Wi-Fi. DISCOUNTS - www.hillcreststjohn.com/seniorcitizens.html. Visit their website for complete contact information and details, or call (340) 776-6774 or E-mail hillcrestguesthouse@yahoo.com. Into The Mystic is a classic Caribbean villa, remodeled in 2008, with beautiful island architecture and breathtaking, long range views of Coral Bay and the British Virgin Islands. Into The Mystic is located conveniently on paved roads, just a two minute drive from Coral Bay and less than ten minutes from the National Park's fabulous North Shore beaches. Wonderful landscaping provides superb privacy with blooming flowers and trees without blocking any views. Visit their website for rates, specials and photos. Island Getaways offers a wonderful selection of 2 to 6 bedroom villas, all with spectacular ocean views, private pools, and just minutes to the VI National Park beaches. Each villa is fully furnished and reflects the open air tropical feeling of the island. Airport & water taxi service, jeep rentals, dockside greeting, private chef, housekeeping and child care services are all available. Island Getaways has been creating unforgettable vacations since 1996. For more information call 888-693-7676 toll free, email Island Getaways, or vist their website. Lavender Hill Suites - Upscale, spacious, and newly decorated, Lavender Hill features decks and balconies with panoramic views of harbor, ocean, other islands, and sunsets. Steps from shops and ferries, Lavender Hill is convenient yet private and secluded. Each unit features kitchen, AC bedrooms, TV, VCR, CD, on-line computer, pool, laundry. Visit their Web site for more pictures and rates. Morningside Villa Enjoy spectacular sunrise to sunset views in the complete privacy and elegant comfort of your own personal villa featuring four air-conditioned bedrooms each with private bath, fully furnished kitchen, and a pool and whirlpool located on a sundeck that is wonderfully secluded, yet still provides a panoramic view of Rendezvous Bay and the Caribbean beyond. Morningside's open floorplan makes it the perfect vacation home for just the two of you, or your family and friends. Located just 5 minutes from Cruz Bay over all paved roads, Morningside Villa is the perfect base from which to explore St. John. Odessa Villa In harmony with the outdoors and nearly surrounded by the sea, Odessa flows into an exotic tropical garden. Blooming frangipani, bougainvillea, native trees and giant cacti encircle this West Indian style 3 bedroom, 3 bath beach house offering jacuzzi and pool with complete privacy. A private path leads to Hart Bay beach, which you usually will have to yourself, because there is no road access. Visit their website for more information and photos of this unique villa. Perelandra Very Private, Romantic 2 bedroom 2 bath villa with spectacular views! Upstairs or down, inside or out, the views, privacy, comfort, and romantic ambiance of this intimate, elegant villa will delight you. Clinging to the hillside above Cruz Bay, Perelandra's breathtaking views sweep from the deserted cays nestled in the Windward Passage to the sailboats skimming through Pillsbury Sound to the spectacular sunsets resting upon St. Thomas. Visit their site for more photos, rates, and availability. Located atop Gifft Hill, Plumeria features panoramic ocean views and spectacular sunsets, among the finest on St. John. Its layout provides the ultimate in Caribbean indoor/outdoor living, with large French doors in every room opening onto the interior courtyard, sundeck, and pool. Outdoor living spaces include a very comfortable porch facing the view, a solar-heated pool with LED lighting, expansive decks, a large built-in spa, and the dining gazebo with its new granite outdoor kitchen. You can be dining at one of the many fine restaurants in Cruz Bay less than 10 minutes after leaving your villa. Incredible ocean views and sunsets, complete privacy, lush tropical landscaping, and high-end amenities - you will be so completely relaxed and refreshed by your stay at Plumeria .... you won't want to leave. Seaview Vacation Homes is a Vacation Rental and Management Company on the beautiful Caribbean island of St. John. Seaview Homes offers 1 to 5 bedroom fully furnished vacation homes and villa accommodations with all amenities, including some with pools, hot tubs, and air conditioning. Their homes and villas all offer commanding ocean views and are close to the famous North Shore beaches in the National Park. Visit their Web site for more details. Call or e-mail for special villa discounts 1-888-625-2963. Serendip Vacation Condos Sunsets, serenity, serendipity -- that quality of unexpected good fortune -- are yours to experience at Serendip Vacation Condos. Soak up the sun on your spacious, private veranda overlooking three acres of lush, tropical vegetation. 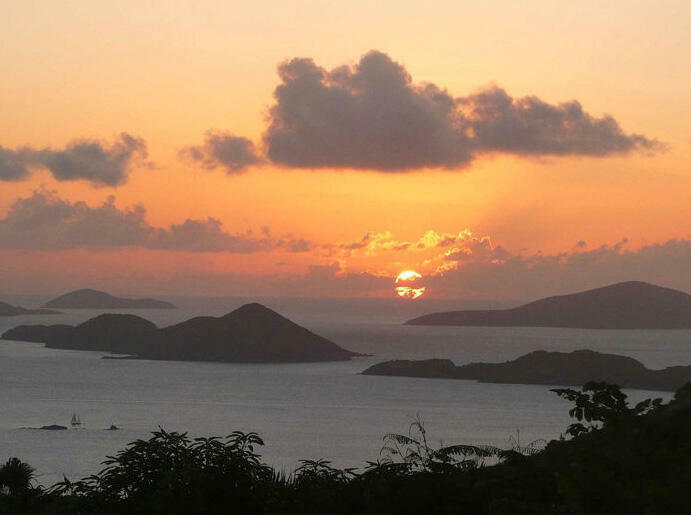 Watch the sun sink into the sea as the lights of St. Thomas twinkle at you from across Pillsbury Sound. Count sailboats, listen to the rustle of palm fronds in the breeze, sip a cool drink, or just - do nothing! Visit their Web site for complete information. South Shore Villa Introducing St John's newest luxury villa. Located within the National Park boundaries and perched high a top a mountain overlooking the azure waters of the Caribbean, the South Shore Villa is the ultimate in private luxury living. The villa is centrally air-conditioned and features four well-appointed bedrooms (all with private bathrooms), a luxurious custom kitchen with restaurant quality stainless steel appliances, a dining room, and a large living room all with panoramic views of the ocean. The villa also features beautiful handmade furniture, art, and high-end electronics (HD flat screen TVs in all of the bedrooms, premium sound system). Of additional interest is the spectacular infinity edge swimming pool with fountains, a large travertine patio, covered veranda, and a stainless steel barbeque for entertaining. Visit their website for more photos and rates. Since 1995, WhereToStay.com has been the expert on St. John hotels and St. John villa rentals. People have come to trust the impressive collection of luxury vacation homes, most of which are "WhereToStay Verified" by the most experienced villa consultants in the business. While you can find many St. John villas on any number of sites, WhereToStay.com is the only company where you can talk to villa consultants who know the villas and the islands through personal experience. This experience means WhereToStay.com will help you find the perfect place to meet the requirements of your group and your budget. From luxury rental homes on St. Thomas to private villas on St. John, WhereToStay.com has them all. Want proof? Call 800-869-8017 and in 2 minutes you will be convinced our villa consultants are truly villa experts. St. John Ultimate Villas As their name implies, St. John Ultimate Villas represent the ultimate villas on St. John. In addition to their outstanding villas, they provide a wide array of services to make your stay on St. John unforgettable. Their high standards mean they only represent the finest villas available for the high-end, luxury travel market on St. John, so you can rest assured that your accommodations will be everything the discriminating traveler expects. Visit their brand new website for rates, videos and more details. Suite St. John Villas & Condos has built its reputation on having the most elegant Villas & Condos combined with impeccable customer service. Visit their Web site to see all the fine properties they represent. Vida de Mar Nestled in quiet and secluded Dever's Bay on the southwest shore of beautiful St. John, Vida de Mar is the perfect place for a fabulous Virgin Islands vacation. Vida de Mar is a luxurious Caribbean beachfront villa with five air-conditioned bedrooms to accommodate two to ten with ease. Secluded, yet minutes to town -- you get the best of both worlds! Visit their website for more information, photos, and rates. Villa Colorado is a luxury villa on Great Cruz Bay. Spectacular ocean views from every room, four equal king-size master suites, a 32' lap pool and the superb Great Cruz Bay location make Villa Colorado a favorite vacation destination. The Villa has lush tropical gardens and enjoys spectacular sunsets. Visit their Web site for more information, photos and rates. Inspired by British Colonial design Villa Tesori boasts over 2,000 square feet of outdoor living space and 4,894 square feet under roof with 5 bedrooms and 5 ½ baths. Located in Rendezvous/Ditliff, gorgeous views of the ocean, Hart Bay, Monte Bay, Klein Bay, Fish Bay, Reef Bay and the island of St. Croix are enjoyed throughout the residence as well as all day sun. The villa is fully air-conditioned, and totally screened with an automatic generator, so no power outages here. The expansive living area features cypress ceilings with mahogany rafters, Italian tile flooring, large oriental rugs with mahogany coffee table, oversized bamboo sofas and chairs for relaxing or watching TV. The covered rotunda, located just off the dining and living room areas, showcases the native Caribbean stone walls as well as the cypress ceilings with mahogany rafters. The spacious pool deck offers comfortable chaise lounges and snack tables. The master suite and three guest suites are in the main house making this an ideal home for families with small children. The Francis Bay Suite with queen bed, sits on the main level, just off the kitchen area. An interior staircase takes you upstairs, where the Master Suite as well as the Maho and Cinnamon Bay guest suites are situated. Both guest suites contain queen beds. The fifth bedroom, below the pool, has a king bed and full kitchen. Impressive design, uncompromising quality, informal comfort, all make Villa Tesori truly a "House of Treasures"...available to rent for the most discriminating traveler. Ever dream of vacationing in a multi-million dollar St. John villa rental? How about a St. John Honeymoon? Or renting a Peter Bay Villa on the Northshore? Think Caribbean rentals were too expensive? VillaVacations.net can make St. John villa rentals a reality! Often times, VillaVacations.net luxury rentals are cheaper than a cramped resort guest room. Their villas offer seclusion and privacy that just can�t be duplicated at resorts, and all of their vacation villas are close to the world famous St. John Beaches, some within walking distance! Visit VillaVacations.net for more information, photos and prices. Villa Venturoso is a beautiful 2 bedroom, 2 bath home situated in a great location above Cruz Bay, with gorgeous views to St. Thomas over St. John. Fully equipped kitchen and a swimming pool are just some of the amenities. Villa Venturoso is within walking distance to town and available to rent year round. Visit their website for more information and to book directly from the owner. VIVA! Villas Inc. St. John rental villas where you can expect consistent Quality, Value, and Service Excellence. Their on-island staff of professionals will suggest accommodations that fit your taste, style and budget to plan the vacation you have always wanted. VIVA Villas offers a large selection of affordable cottages, private villas and luxury mansions across the island for your vacation of a lifetime. Check their selection and availability on-line at the VIVA Villas website. Bolongo Bay Beach Condominums are located just down the beach from the Bolongo Bay Beach Resort. Studios, One Bedroom and Two Bedroom condominiums are available. The Two Bedroom condominiums have a King bed in the master bedroom, two twin beds in the second bedroom and a pull-out sofa-bed in the living room. Perfect for families or friends traveling together. All units have a full kitchen. Each Condominium is fully equipped with Cable TV, A/C, Telephone, Hair Dryer, Iron & Ironing Board and Room Safe; and they all have Balconies that face the water. Visit their Web site for more information. Katmari A seaside hideaway awaits you at Katmari. This beautiful, tropical home entices you to kick back and discover spectacular views from any room. Katmari features 3 exquisitely appointed master suites - all with king size beds and private balconies overlooking the Caribbean sea. The main house's spacious living room, cozy family room and a favorite, the observation room, were designed with comfort in mind. Minutes from Magen's Bay Beach. Visit their Web site for info, rates and photos. Since 1995, WhereToStay.com has been the expert on St. Thomas hotels and St. Thomas villa rentals. People have come to trust the impressive collection of luxury vacation homes, most of which are "WhereToStay Verified" by the most experienced villa consultants in the business. While you can find many St. Thomas villas on any number of sites, WhereToStay.com is the only company where you can talk to villa consultants who know the villas and the islands through personal experience. This experience means WhereToStay.com will help you find the perfect place to meet the requirements of your group and your budget. From luxury rental homes on St. Thomas to private villas on St. John, WhereToStay.com has them all. Want proof? Call 800-869-8017 and in 2 minutes you will be convinced our villa consultants are truly villa experts. Villa Taormina is located on the East End of St. Thomas. This private, gated four-bedroom villa is enchanting in every way. The floor plan of this retreat flows seamlessly: the fenced garden courtyard, large pool and expansive deck sit between two pavilions. Outdoor living is made complete with tropical plantings, generous patio and sunbathing furniture, a grill and the fantastic view! Villa Taormina offers privacy, comfort and total relaxation... truly a choice destination. Visit their website for more photos and complete information. Wintberg Place is the perfect choice for a budget minded traveler with refined taste. This newly remodeled one bedroom apartment combines elegant furnishings in modern accommodations - WITH a view! The world famous Magen's Bay beach or Mahogany Run Golf course are only �ve minutes away (2.5 miles). Wintberg Place is centrally located on the island of St. Thomas. You'll have quick and easy access to downtown, Frenchtown, Yacht Haven Grande or the evening hot spots in Red Hook on the East end. No destination is more than ten minutes away and we're easy to back track to... we've placed a sign to mark our road. Wintberg Place is an apartment located in a privately owned home with separate access to the entrance and parking. The owner's are on site and available for assistance.